When I wake up in the morning… I turn on my TV and watch Zack Morris, Kelly Kapowski and Screech get into crazy shenanigans. From 1989 to 1993, Saved by the Bell captured the hearts and minds of America's youth. And now, still airing in syndication more than a quarter-century later, the once-critically panned teen sitcom has become a cultural phenomenon. Here are 22 things you might not know about Saved by the Bell. 1. SAVED BY THE BELL BEGAN AS A DISNEY SERIES STARRING HAYLEY MILLS. In 1987, NBC aired the pilot for Good Morning, Miss Bliss, a teen sitcom featuring Hayley Mills (star of The Parent Trap and Pollyanna) as sixth grade teacher Miss Bliss. In the pilot, which only aired once on NBC, the main students were played by Brian Austin Green (who would go on to star with Tiffani Amber Thiessen on Beverly Hills, 90210), Family Matters' Jaleel White, and seaQuest DSV’s Jonathan Brandis. NBC ultimately decided not to pick up the series, but the Disney Channel agreed to air Good Morning, Miss Bliss for one season. Mark-Paul Gosselaar (Zack Morris), Lark Voorhies (Lisa Turtle), and Dustin Diamond (Samuel “Screech” Powers) joined the cast. Good Morning, Miss Bliss ran for 13 episodes before being dropped by Disney and picked back up by NBC. 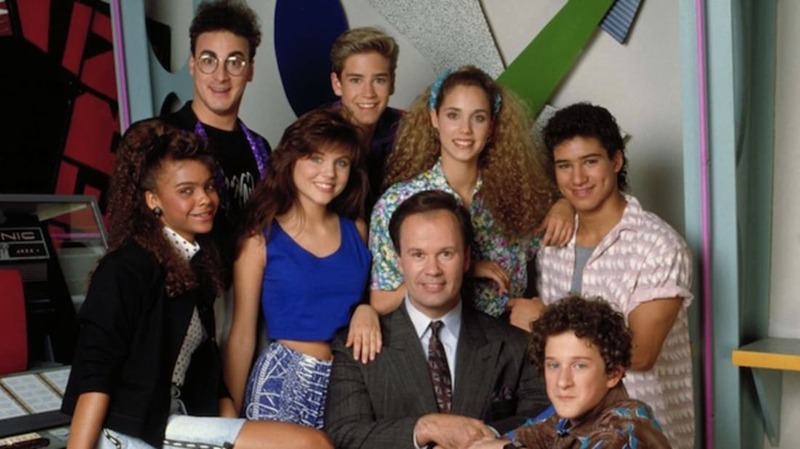 NBC gave Good Morning, Miss Bliss a significant facelift—aging up the students, adding Tiffani Amber Thiessen (Kelly Kapowski), Elizabeth Berkley (Jessie Spano), and Mario Lopez (A.C. Slater) to the cast, and shifting the focus away from the teachers to create the Saved by the Bell audiences came to know and love. 2. MARK-PAUL GOSSELAAR, MARIO LOPEZ, AND DUSTIN DIAMOND ARE THE ONLY ACTORS TO APPEAR IN ALL 86 EPISODES OF THE SHOW. If you include the episodes formerly known as Miss Bliss, only Gosselaar and Diamond hold this distinction. Diamond is also the only original cast member to appear as a regular in all Saved by the Bell spinoffs and movies. 3. ELIZABETH BERKLEY AUDITIONED FOR THE ROLE OF KELLY KAPOWSKI. Elizabeth Berkley was in the running to play Kelly Kapowski, Zack Morris' dream girl. While the role ultimately went to Thiessen (because, of course it did), the producers liked Berkley so much they created the character Jessie Spano specifically for her. 4. BERKLEY WASN'T ALWAYS THRILLED WITH HOW HER CHARACTER WAS PORTRAYED. 5. MARK-PAUL GOSSELAAR AND LARK VOORHIES DATED FOR THE MAJORITY OF THE SHOW'S RUN. While Kelly Kapowski held the keys to Zack Morris' heart, Lark Voorhies had Mark-Paul Gosselaar's on lock. The couple dated for three years, including during the filming of Saved by the Bell: Hawaiian Style. In 2009, Gosselaar told People that “All of us dated at one point or another—it was incestuous!" 6. GOSSELAAR HAD TO DYE HIS HAIR EVERY TWO WEEKS DURING FILMING. 7. MARIO LOPEZ CREDITS SLATER’S DO (OR DON’T) TO MEL GIBSON. 8. THERE WAS NO SWEARING ALLOWED ON THE SET. 9. KELLY AND JESSIE MYSTERIOUSLY DISAPPEARED IN THE FINAL SEASON … UNTIL GRADUATION DAY. After filming Saved by the Bell's final season, but before the episodes aired, NBC decided to double their episode order, a move that would require re-signing the entire cast. While the majority of the cast renewed their contracts, Thiessen and Berkley refused. Enter, Tori Scott. To solve the lack of female lead—and love interest for Zack—problem, the show introduced a new character, tough girl new student Tori Scott (played by Leanna Creel). With no explanation, Tori joined the gang and Kelly and Jessie were never mentioned again. Until graduation, that is. The show's finale, which featured the crew's high school graduation, was filmed before Thiessen and Berkley's exit. So Kelly and Jessie appear in their caps and gowns alongside their best buds. Conspicuously missing? You guessed it: Tori. 10. CHUCK KLOSTERMAN CALLS THIS "THE TORI PARADOX." On paper this seems idiotic, borderline insulting, and—above all—unreal. But the more I think back on my life, the more I've come to realize that the Tori Paradox might be the only element of Saved by the Bell that actually happened to me. Whenever I try to remember friends from high school, friends from college, or even just friends from five years ago, my memory always creates the illusion that we were together constantly, just like those kids on Saved by the Bell. However, this was almost never the case. Whenever I seriously piece together my past, I inevitably uncover long stretches where somebody who (retrospectively) seemed among my closest companions simply wasn't around. I knew a girl in college who partied with me and my posse constantly, except for one semester in 1993-she had a waitressing job at Applebee's during that stretch and could never make it to any parties. And even though we all loved her, I can't recall anyone mentioning her absence until she came back. And sometimes I was the person cut out of life's script. 11. ERIC DANE, DENISE RICHARDS, TORI SPELLING, AND OTHERS GUEST-STARRED. Eric Dane (whom you probably know best as Grey's Anatomy's Dr. Mark Sloan) appeared as a volleyball opponent at the Malibu Sands Beach Club in a 1991 episode. Denise Richards also made an appearance at the Malibu Sands Beach Club, as a girl infatuated with Slater. Tori Spelling (whose dad, Aaron, was one of the show’s producers) had a recurring role as Violet Anne Bickerstaff, a love interest for Screech. Christine Taylor, Scott Wolf, Leah Remini and others also had guest-starring roles. 12. THE SHOW’S SET IS ALIVE AND WELL, AND STILL BEING UTILIZED BY THE DISNEY CHANNEL. Following Saved by the Bell's cancelation, the set was never completely struck down. You can catch glimpses of Bayside High School in reruns of That's So Raven (where the school is also named Bayside High) and Nickelodeon's iCarly (where it's redubbed Ridgeway Middle School). 13. THERE'S A SAVED BY THE BELL MUSICAL. And it's a total joke. In September 2013, Bayside! The Musical!—which is described on its website as “the unauthorized, hilarious, and raunchy musical parody of TV’s Saved By The Bell,” premiered at New York City's Theater80 to surprisingly positive reviews. The “tacky, wacky and totally Zacky” show consists of 17 musical numbers and answers such burning questions as: Will Zack and Kelly break up? Will Slater quit wrestling forever? Who will develop an incurable caffeine addiction? And, Will Screech die?! Bayside! The Musical! is still running, but only through August, so get your tickets today! 14. IT’S ALSO A COMIC BOOK. 15. MR. BELDING’S CATCHPHRASE WAS PARTIALLY DENNIS HASKINS’ OWN INVENTION. 16. DUSTIN DIAMOND'S FIRST ATTEMPT AT A TELL-ALL MEMOIR WAS DROPPED BY HIS PUBLISHER. Diamond secured a deal with Gotham Books to write a “salacious” tell-all memoir about his time on Saved by the Bell in 2009, for which he was awarded a six-figure advance. However, Gotham backed out after a series of unfortunate events. According to the New York Observer, Diamond's ghostwriter, Alan Goldsher, was first taken off the project due to “scheduling issues.” Then, Gotham allegedly deemed the completed manuscript unpublishable—something Diamond's literary agent, Jarred Weisfeld, denies. 17. DIAMOND'S BOOK EVENTUALLY SAW THE LIGHT OF DAY. 18. DIAMOND CLAIMS HE NEVER APPROVED THE BOOK. 19. HASKINS WASN’T PLEASED ABOUT BEING LEFT OUT OF A 2009 REUNION. That same year, Haskins surprised Thiessen during a 2013 segment on The Today Show. The result was, well, awkward. 20. THE UNAUTHORIZED SAVED BY THE BELL MOVIE WAS A FLOP. Though it generated plenty of headlines and “things we learned” stories after it aired, only 1.6 million people tuned into Lifetime last Labor Day to watch The Unauthorized Saved by the Bell Story (which Diamond produced, though both he and Lifetime denied that it was based on Behind the Bell). 21. A.C. SLATER GOT HIS OWN WEB SERIES. Notice we said A.C. Slater and not Mario Lopez? In 2006, Lopez's Saved by the Bell character's storyline continued with a five-episode Web series titled 28 Day Slater. The premise? Every February, an implant in Lopez's brain would trigger him to believe that he was, in fact, A.C. Slater for a full 28 days. Mullet and tight-fitting Ts included. Former NBC President Brandon Tartikoff, who passed away in 1997, was the only person who knew how to disable the implant. When asked about her favorite memory from the show, Berkley didn’t hesitate in responding, “The ‘I'm so excited!’ episode [when Jessie uses 'caffeine pills']. It was so extreme. We made a music video; we were thrilled!"